What really sets Gravity Lander aside from other casual games populating the App Store is its great visuals. Büro Destruct has gone for a pixel retro look with a limited colour palette, which elevates this quick time-killer to an absolute graphical beauty. Fonts and music has also been carefully picked, contributing to the overall high quality end product. Dieses Spiel ist super! Wie ein Kunstwerk! Auf jeden Fall holen! When I saw the PRO listed, I immediately bought it and the aesthetic pleasure continues – it is a beautiful piece of work. Again, the game component is fun, but I enjoy it as much for the look.The random/gravity aspect also makes it very replayable. Das Spiel bringt Spaß und ist ein richtiger Zeitkiller ;) Empfehlenswert! It's amazing. I was so hooked I played it constantly until I completed it! Echt ansprechendes und reizvolles, da durchaus anspruchsvolles und durch seine tolle Schlichtheit begeisterndes Game. 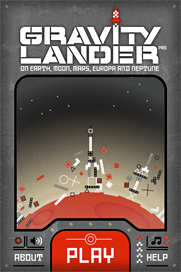 Swiss design stylee, arty pixel puzzler Gravity Lander PRO sets down on planet iPhone. Who would have thought that pinball and landing a spaceship would combine well as a game? The chaps over at Swiss developer buro destruct, that's who. Le jeu compte 100 niveaux selon 3 niveaux de difficulté, et surtout une réalisation épatante à base de gros pixels. So schlicht und dennoch so unterhaltsam, dieses Spiel ist eine Perle in den Massen von Schrottgames, super Leistung! Great Game. This is by far the best game that I have played on my Iphone! Da avere assolutamente, dato che è gratis. si finisce presto (per coloro a cui piace, il PRO è più impegnativo e ha molti più livelli), ma è davvero molto curato. Per me è anche più divertente e accattivante (per grafica e suoni) di Angry Birds. Gravity Lander ist ein Game, und es ist Kunst. Retro-Design und -Sound, dazu das brillant einfache und dennoch lustvoll vertrackte Spielprinzip machen das Game zu einem diskussionslosen Muss. cluttering the landing bases. Beware of obstacles like bumpers, wheels, lifts, explosives, trampolines and debris on your flight down to the base. Use boosts and tilt your device for a new action experience. to succeed the 100 missions.